Temperatures are in the low-40s to high-30s with cloudy skies. Road conditions will be great, as no precipitation is expected this morning. Winds are going to be a tad high, which will cause wind chill values to decrease into the lower-30s. Have that heavier coat with you this morning. Today will start out dry and cold and these conditions will continue into the afternoon hours. The dry weather may come to an end as rain is expected this evening. While not much rain is expected, it may cool things down for us with the combined wind. Make sure to wear a heavy coat that will shed off water. Temperatures will work themselves up into the mid-40s, then drop this evening into the low-30s. Winds will become a tad calmer, which will help lessen the wind chill factor. Our Tuesday this week will bring chances for flurries throughout the entire day. Temperatures are taking a colder shift as they are expected to increase into the high-30s. A high-pressure system to our west will cause the temperature drop due to its clockwise wind flow. Tomorrow night is going to get cold as temperatures are going to drop into the high-20s and winds will consistantly stay out of the northwest. Bundle up if you will be out and about tomorrow night. That blue H will be making its way through our area. Notice, as the H moves east, the winds start from the North, then end coming from the south as the high pressure propagates to our east. 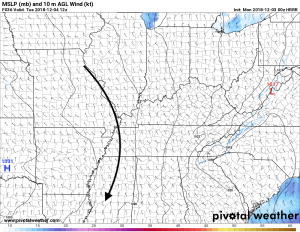 Since Kentucky will be on the backside of that high pressure, the clockwise rotation will create southerly winds for the Ohio River Valley. With the continued high pressure throughout Wednesday, this will keep conditions clear and sunny. Those southerly winds toward the end of the day will not really warm things up for us. Temperatures will top out in the up-30s, then reach its lowest point in the mid-20s. The skies will be clear for the most part, however, you may see some clouds here and there. Temperatures will stay below the 40s into Friday, then will continue to drop into the weekend. Snow chances are are beginning Friday night and remaining into the Saturday. 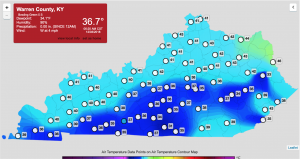 The lows will range from the high-20s into low-30s. Break out the gloves and hat, this weekend is about to get chilly! Well that is all I have for y’all today. Make sure to bundle up, as we got a cold and clear week ahead. Also, follow @wxornotbg for your latest weather updates. Have a great week and come on back tomorrow!